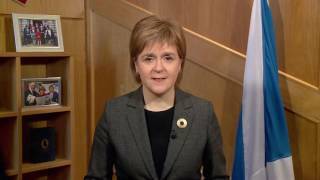 First Minister Nicola Sturgeon has recorded a video message to wish people across Scotland a happy St Andrew's Day. The video ask Scots to look after friends and neighbours and help make the day a truly special day. In the video message the First Minister said: "This year, we're not simply inviting people to attend celebrations, although we hope that lots of you will. "We're also encouraging people to help each other - to look after friends, neighbours, or people in need. We would like people to share for St Andrew.